The restaurant with long history “Edomae Sushi Nikaku” is located at the foot of Mt. Adachi, about 15 minutes away by taxi from Kokura Station in Fukuoka. 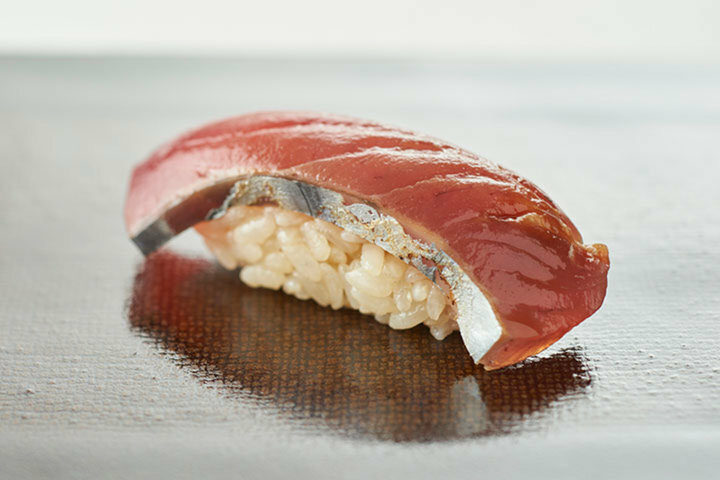 It was founded in 1965, and the third-generation master Mr. Setsuo Funahashi, who took over the restaurant, is pursuing refined Edomae (Edo-style)sushi which can be savoured only in the area. 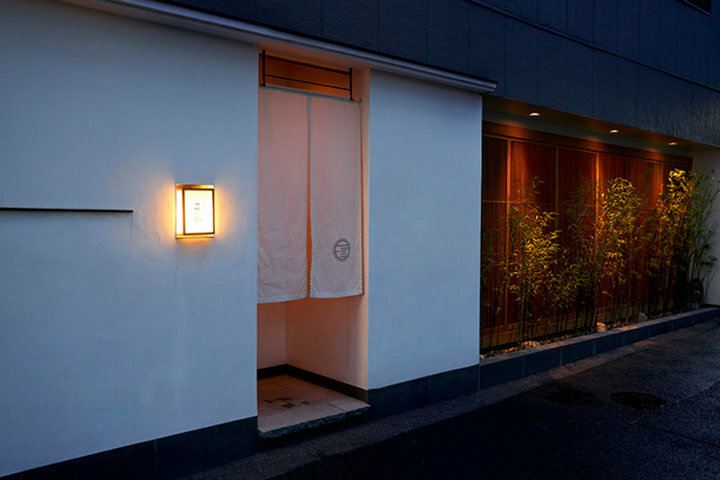 Nikaku establishes an excellent reputation and was awarded two stars on Michelin Guide: Fukuoka/Saga in 2014. 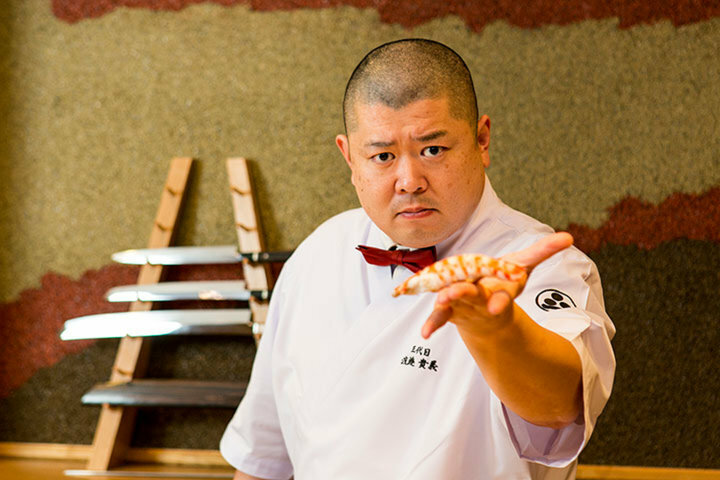 Mr. Funahashi went to Tokyo at the age of 20, learned Edo-style sushi for twelve years at a well-established sushi restaurant and returned to his hometown in 2002. 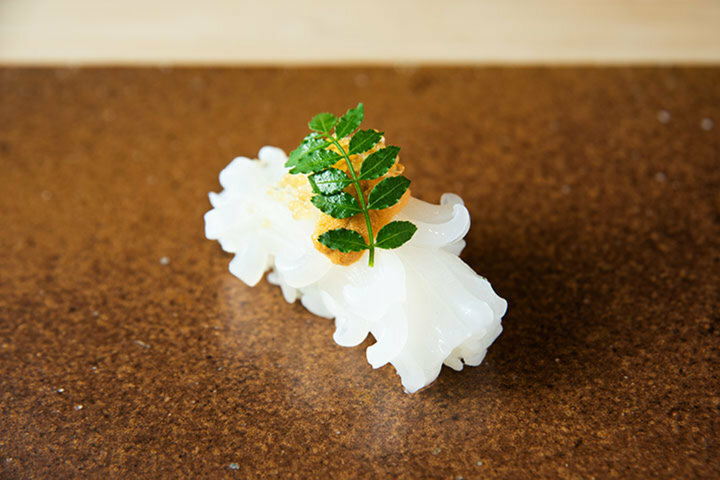 He has taken over the authentic Edomae tradition and skills (salting, soaking in vinegar, steaming, simmering, and marinating) which were devised in the olden days in order to maintain the quality of fishes at the proper level. Using the skills, he is making his unique yet authentic sushi with fresh local seafood. 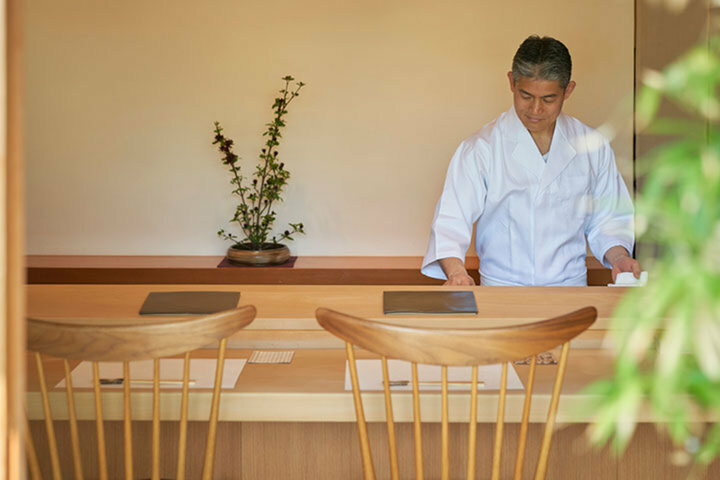 “I would like customers to feel the four seasons through my sushi.” said Mr. Funahashi. 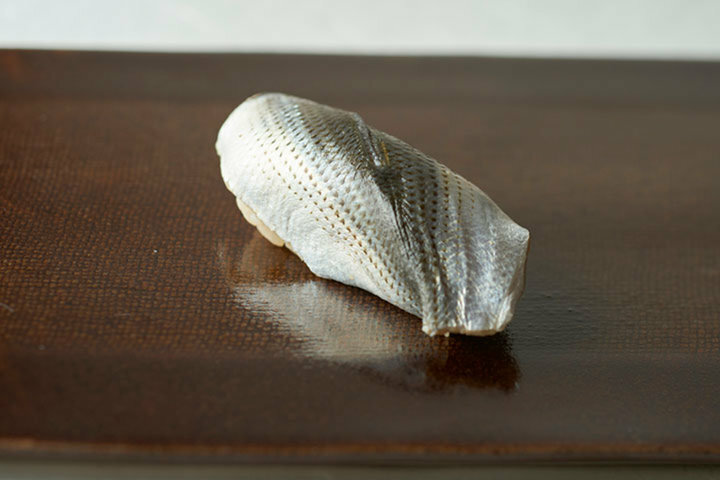 “There are a number of things which can be savoured only at my restaurant.” For instance in spring, Nikaku serves horsehead tilefish which is known as the rare fish, and Japanese cockle from the Busen Sea. The local sea urchin and young gizzard shad from the Ariake Sea in summer. They express the seasons with fishes in season. 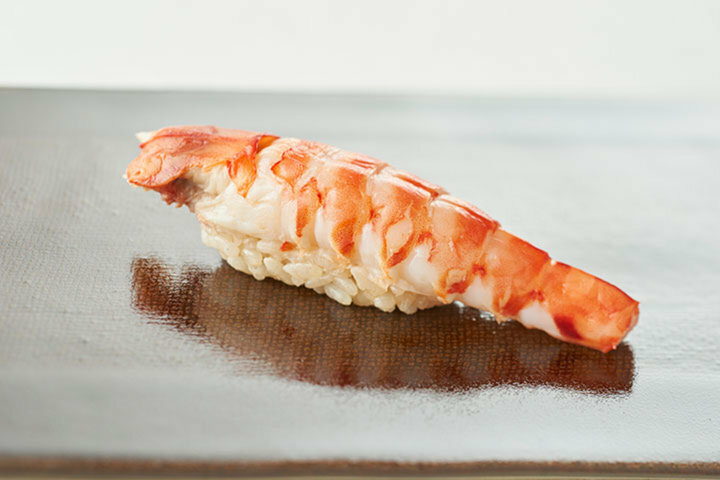 The sushi vinegar they use is made with only original red vinegar and salt from Sanin-region which has perfect balance of minerals. Nikaku sticks to selecting its sake being local, having 12 kinds of specially selected sakes which are all made with water and rice from Fukuoka Prefecture. They also have a rare local beer which is not filtered or heat-treated. 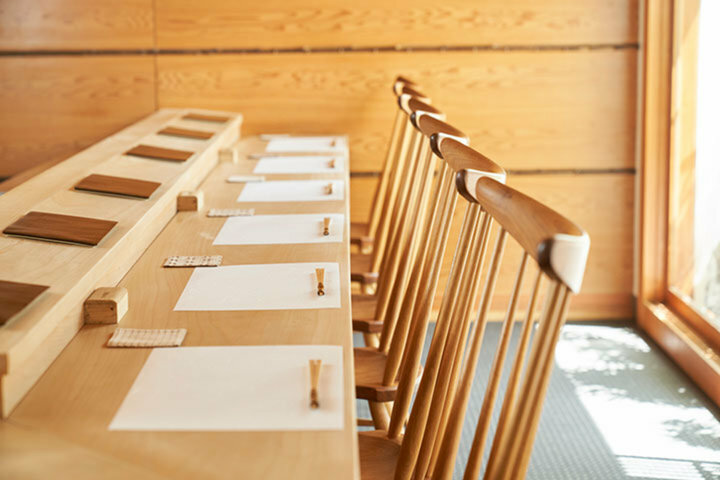 The counter is a plank of 300 year-old gingko tree and there are only eight seats available. Natural light comes into the room through the shoji screen showing different faces of the restaurant in the day and at night. Nikaku is the perfect place to spend valuable time with your loved ones in friendly atmosphere. 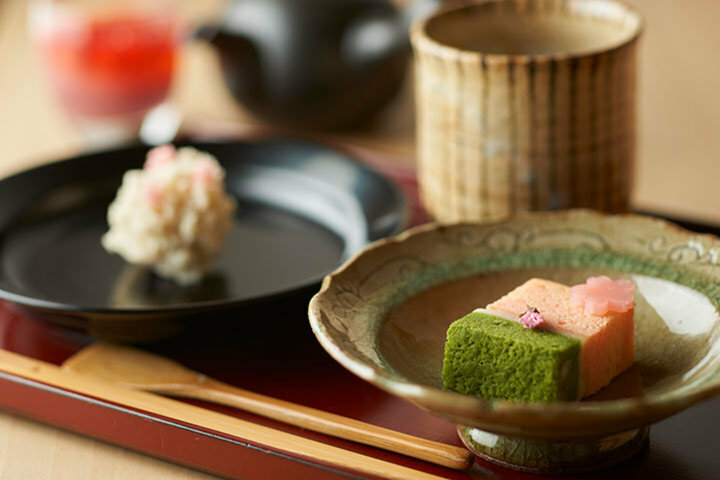 You want to come to this famous restaurant every season to savour its sushi which use in-season fishes caught in Kitakyushu, and experience the elegance of “Edomae”.